As we prepare to launch U.S. astronauts on new spacecraft and rockets with Boeing and SpaceX, we want kids to have a fun way to learn more about space and the excitement that comes with flying astronauts while being creative! We are holding our fifth annual kids artwork contest. 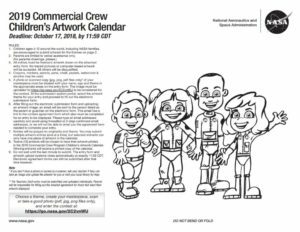 We are asking children around the world ages four to 12 years old to share their space artwork with us. The winning artwork will be used to create a 2019 calendar with different space-related themes for each month. The themes educate students about the International Space Station, astronauts, growing food in space and more! Unique and original artwork will be selected for each month. Once the calendar is complete, it will be transmitted to astronauts aboard the space station. The calendar also will include supplemental education materials for kids here on Earth to learn more about the space-related themes. For more information about the competition’s themes, rules and deadlines plus the entry form, download the contest PDF.